Hey, everyone! I try to be as holistically-minded as I can when it comes to my health and taking care of myself. This absolutely includes how I take care of my hair! I have to admit that I put my hair through a lot, lol. I get it colored regularly and style it (blow dry, flat iron, and then curl it) almost every day. It’s exposed to a lot of heat and damaging elements! I try to use the best products to keep it as protected and healthy as possible, but sometimes it definitely needs a little extra lovin’. 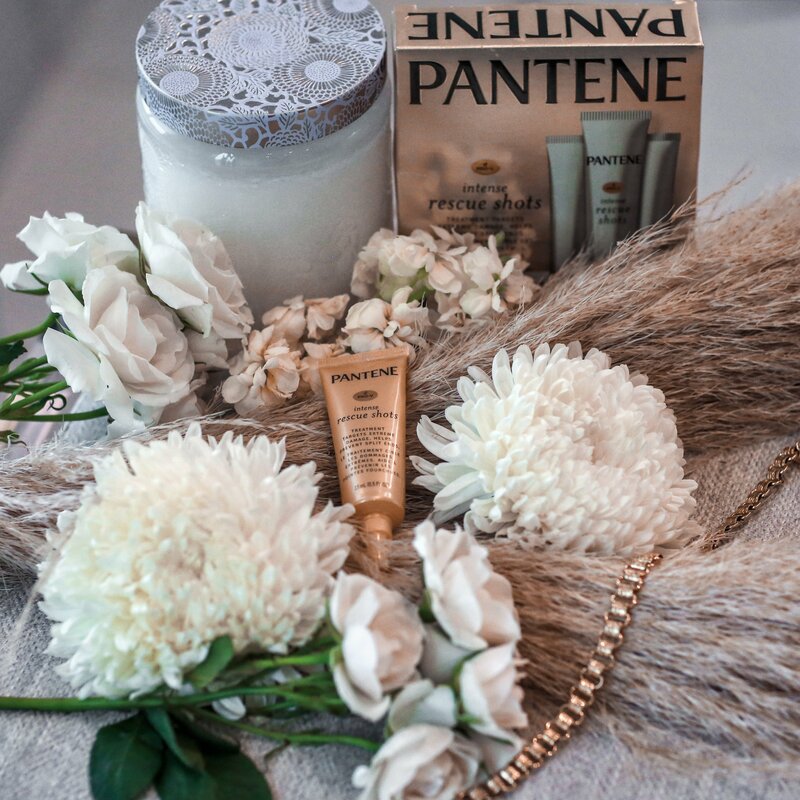 Pantene has been working hard for almost 80 years to ensure that women everywhere can achieve a sense of empowerment that comes with having healthy, beautiful hair – not just hair that looks the part but hair that is truly nourished inside and out. They know what they’re doing! Their vision is to help women experience the amazing feeling of a great hair day even when life (and with it, lots of styling) tries to get in the way. I have been really impressed with their newest product and I’m excited to share it with you – I hope you feel inspired to prioritize your personal hair care and beauty routine. Pantene has seriously created a miracle product in their new Pantene Pro-V Intense Rescue Shots that is currently the #1 selling new treatment item in the haircare category. The ingredients, imported from Brazil, are ideal for those times in between salon visits when your hair is dry and damaged but you’re not quite ready for a cut. You can use it up to once per week in place of your normal conditioner which is amazing! It definitely deep conditions but it rinses out quickly so there’s no need to worry about build up or having your hair weighed down by a heavy product. These shots are literally formulated to prevent overdosing. They come in one-use little tubes and are packed full of Pro-Vitamin B5, strengthening lipids that absorb directly into the hair, and natural glycerin to help give hair a boost of flexibility and resilience to help combat damage and stress. Use the Pantene Pro-V Intense Rescue Shots once per week in place of your normal conditioner. In the shower after shampooing, apply the Pantene Pro-V Intense Rescue Shots so that it fully saturates your hair from root to tip. Consider focusing on especially damaged areas! Don’t hold back! Use all the product in the tube; it is designed for single-use! Leave the product in your hair for 30 seconds to allow all the nutrients to soak in. Rinse the product for 30 seconds – but don’t over-rinse! It is seriously that simple. I am loving the results I’m seeing – bouncier, healthier, shinier hair that is more resilient so that I can continue to live life fully without compromising the health of my hair. The Pantene Pro-V Intense Rescue Shots are available now at Target! Special thanks to Pantene for partnering on this post. All thoughts and opinions are my own. Great featured item. Absolutely adore ♥️Pantene! LOVE your rings so much! Can you share where you bought them? Where is that dress from? So cute! !